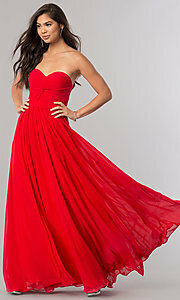 Elegant ruching adds a sophisticated touch to this strapless sweetheart floor length gown. Swirling pleats fan across the bodice front with a twist while tiny pleats cross horizontally at the back of this long chiffon gown and a corset back with zipper lets you customize the fit. The full floor length skirt echoes your movement as you walk into the room or move across the dance floor at your special occasion whether it be for a wedding party, prom, formal dance or gala military ball. 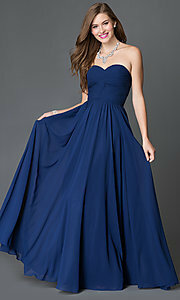 This strapless formal dress has a classic shape yet timeless style. Available in petite or plus sizes, this long corset gown is a great choice for any body type. Since prom dresses and evening gown sizes vary by designer, please remember to use the size chart for DQ-8789 to ensure a proper fit. 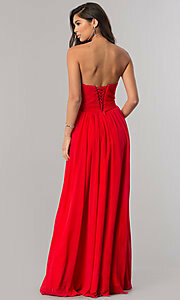 Ruched Bodice, Lace Up Back, Please Note: This dress comes with matching shawl. The model in red is 5' 7" and wearing 6" heels. 53" Hollow to Hem 54"